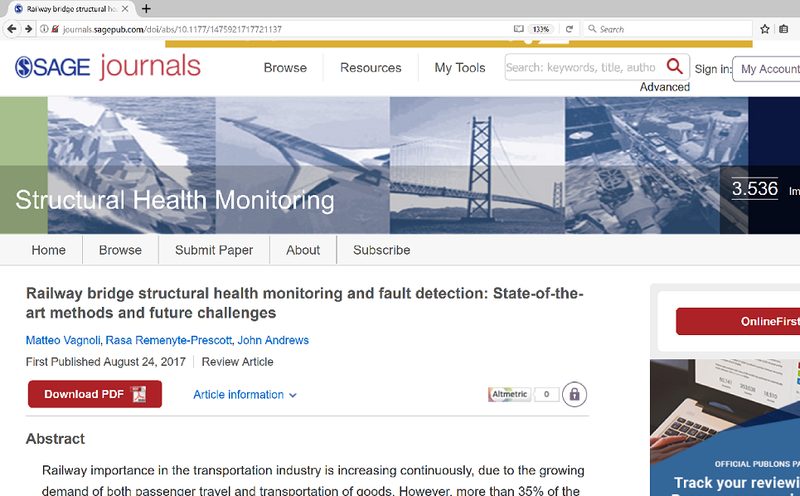 "Railway bridge structural health monitoring and fault detection"
On 24th August 2017, the paper titled “Railway bridge structural health monitoring and fault detection: State-of-the-art methods and future challenges” by Matteo Vagnoli (ESR9), and his supervisors Rasa Remenyte-Prescott and John Andrews, came available in the website of SAGE Structural Health Monitoring. The latter falls within the top quartile of journal publications in the mechanical engineering subject. The paper can be downloaded at the DOI link of the publisher’s website provided with the full reference below or from the academic repository here. Railway importance in the transportation industry is increasing continuously, due to the growing demand of both passenger travel and transportation of goods. However, more than 35% of the 300,000 railway bridges across Europe are over 100-years old, and their reliability directly impacts the reliability of the railway network. This increased demand may lead to higher risk associated with their unexpected failures, resulting safety hazards to passengers and increased whole life cycle cost of the asset. Consequently, one of the most important aspects of evaluation of the reliability of the overall railway transport system is bridge structural health monitoring, which can monitor the health state of the bridge by allowing an early detection of failures. Therefore, a fast, safe and cost-effective recovery of the optimal health state of the bridge, where the levels of element degradation or failure are maintained efficiently, can be achieved. 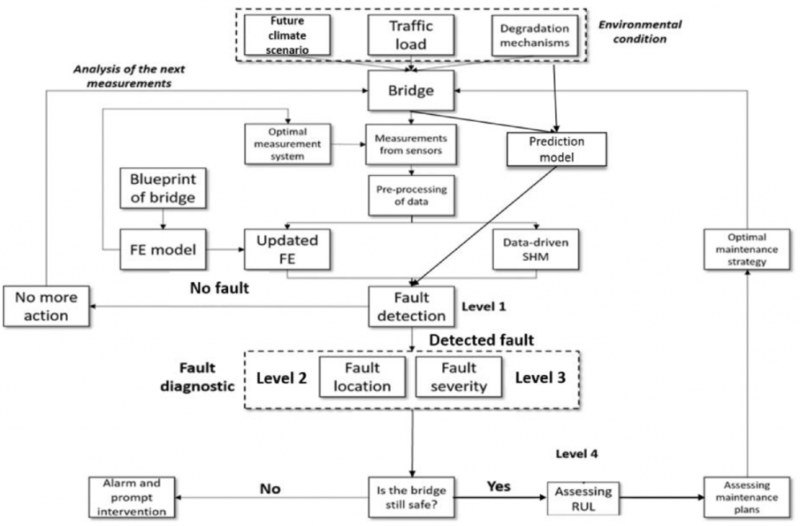 In this article, after an introduction to the desired features of structural health monitoring, a review of the most commonly adopted bridge fault detection methods is presented. Mainly, the analysis focuses on model-based finite element updating strategies, non-model-based (data-driven) fault detection methods, such as artificial neural network, and Bayesian belief network–based structural health monitoring methods. A comparative study, which aims to discuss and compare the performance of the reviewed types of structural health monitoring methods, is then presented by analysing a short-span steel structure of a railway bridge. Opportunities and future challenges of the fault detection methods of railway bridges are highlighted. Keywords: Structural health monitoring; SHM; railway bridges; fault detection and diagnosis; artificial neural network; finite element model updating; future challenges. Vagnoli, M., Remenyte-Prescott, R. and Andrews, J. (2017). 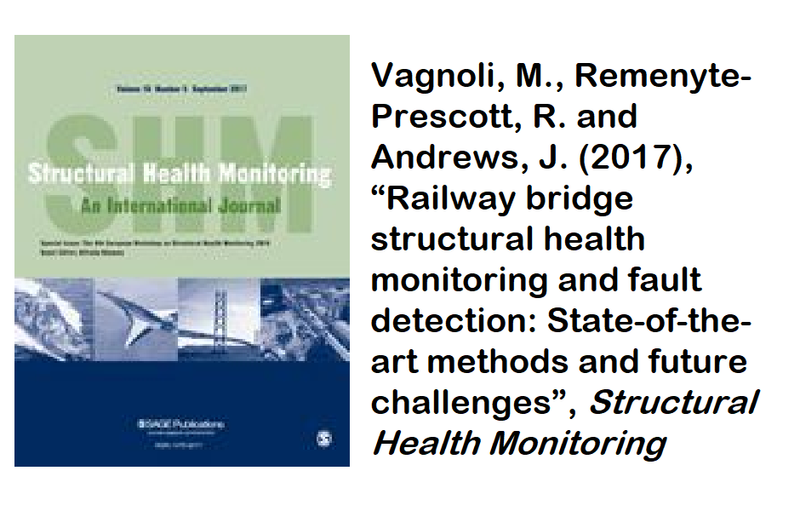 'Railway bridge structural health monitoring and fault detection: State-of-the-art methods and future challenges', Structural Health Monitoring, August, 1-37.